The Fellowship was fortunate enough to obtain a copy of CHEW #31 from Image Comics. The story and lettering is by John Layman, with art and colors by Rob Guillory. Tony Chu is attending his fraternal twin sister’s funeral. He reflects back to when she was there for him at his wife’s funeral, offering support to him and his daughter Olive. He tries to talk to Olive when he finds out that his new partner and he have been reinstated to the FDA. Their first case is trying to figure out why everyone in Heavyweights’ gym suddenly burst into flames and died. Chu and his partner find out this is not an isolated incident as others die in a burst of flames. But who or what is responsible for this…and why? I have not read CHEW before, but knew how it’s a well-regarded book. After this issue I can see why. The premise is an unusual one: a detective with the ability to see the past of an object by biting or ingesting it. But it’s a well written story with interesting characters - that’s what keeps me reading a book. This issue is a nice jumping on point as Chu is back on the force and tackling a puzzling case. There’s enough explained in the narrative that I didn’t need a “previously” page. 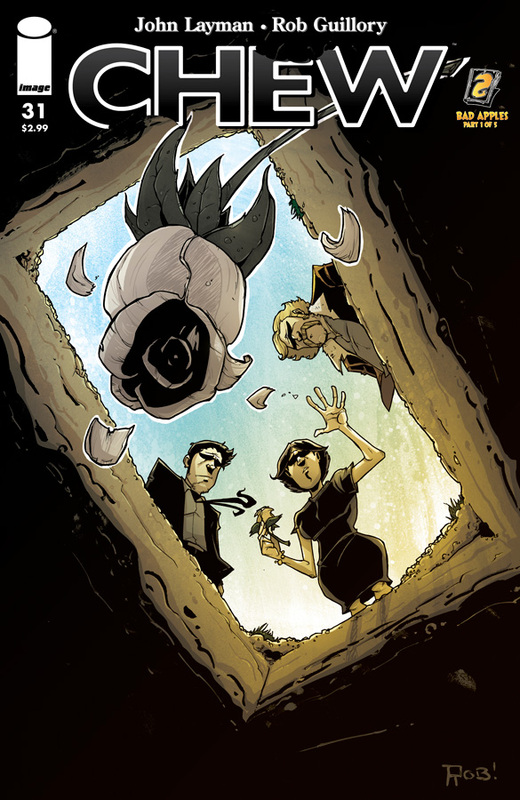 CHEW #1 is in stores now and available at www.imagecomics.com.